1852 outer wrapper docketted "Nassau 13 Oct 1852" landed blue PHILADELPHIA OCT 30 showing "24" surface charge to New York (where it caught the Cunard steamer “Europa” to Liverpool) and black circled "5" for ship to The Rev. 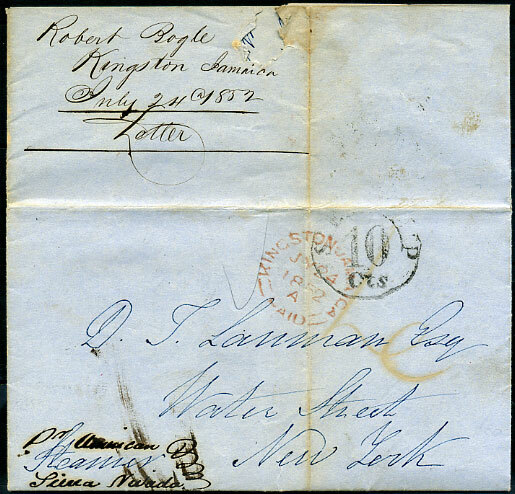 George Osborn, Wesleyan Mission House, London rated 1/- with 17 NO arrival backstamp. 1852 entire from Robert Bogle to D.J. Lanman, New York marked "pr. American steamer Sierra Nevada" with red KINGSTON JAMAICA PAID dated JY 24 1852/A rated red "4" with STEAMSHIP 10 Cts. Contents refer to a great many young men finding their way to Australia determined to seek their fortunes with an agent sent to New York to charter a fine vessel to come here and fit out, she is to carry 50 passengers at $200 each, plus we have had very bad accounts from Navy Bay, a number of people who went there (report) more dead than alive, Cholera has broken out among the people, our authorities act with much indifference, An American Steamer is now coming in from Navy Bay, I suppose I fear the accounts by her will be bad, the operations on the Railway are likely to be impeded if cholera breaks out.